Objective To assess the safety and tolerability of treadmill exercise testing and the association of revealed symptoms with outcome in apparently asymptomatic patients with moderate to severe aortic stenosis (AS). Methods A retrospective cohort study of 316 patients (age 65±12 years, 67% men) with moderate and severe AS who underwent echocardiography and modified Bruce exercise treadmill tests (ETTs) at a specialist valve clinic. The outcome measures were aortic valve replacement (AVR), all-cause mortality or a composite of AVR and all-cause mortality. Results At baseline, there were 210 (66%) patients with moderate and 106 (34%) with severe AS. There were 264 (83%) events. 234 (74%) patients reached an indication for AVR, 145 (69%) with moderate and 88 (83%) with severe AS (p<0.05). Of the 30 (9%) deaths recoded during follow-up, 20 (67%) were cardiovascular related. In total, 797 exercise tests (mean 2.5±2.1 per patient) were performed. No serious adverse events were observed. The prevalence of revealed symptoms at baseline ETT was 29% (n=91) and was significantly higher in severe AS compared with moderate AS (38%vs23%, p=0.008). Symptoms were revealed in 18%–59% of patients during serial ETT conducted over a follow-up period of 34.9 (SD 35.1) months. The event-free survival at 24 months with revealed symptoms was 46%±4% and without revealed symptoms was 70%±4%. Conclusions ETT in patients with moderate or severe AS is safe and tolerable. Serial exercise testing is useful to reveal symptoms not volunteered on the history and adds incremental prognostic information to baseline testing. Limiting symptoms are revealed in a significant proportion of patients with apparently asymptomatic aortic stenosis (AS) on treadmill exercise testing1 2 and are a class I indication for aortic valve replacement (AVR) according to both American and European guidelines.3 4 Conversely, the absence of symptoms on exercise has an excellent negative predictive value with an approximately 10% relative risk of developing spontaneous symptoms or a clinical event within 12 months.5 Furthermore, serial testing may add incremental prognostic information to one performed at baseline. In the literature, however, no previous study has reported the results of serial exercise treadmill tests (ETTs) in patients with moderate or severe AS. Traditionally, there have been some residual concerns about safety and tolerability. This may partly explain why ETT was performed in only 5.7% of patients in the EuroHeart survey with severe AS in whom it was indicated.6 In fact, little data on the safety and tolerability of exercise testing in large populations of moderate to severe asymptomatic AS exist. Thus, our aim was to assess: (1) the safety and tolerability of ETT; (2) the association of revealed symptoms with outcome; and (3) the prognostic significance of serial ETT in apparently asymptomatic moderate or severe AS patients. Baseline height, weight and seated blood pressure were obtained. Hypercholesterolaemia was defined as treatment with lipid-lowering therapy. Hypertension was defined as previously known hypertension, past or current treatment with antihypertensive agents or blood pressure at the baseline clinic visits >140/90 mm Hg.8 All patients with spontaneous or revealed symptoms underwent conventional coronary angiography prior to surgical or transcutaneous AVR. Coronary artery disease was defined as previous myocardial infarction, coronary artery bypass grafting or percutaneous coronary intervention, or angiographic evidence of coronary artery disease. Most patients were studied prospectively in previously reported studies,1 9 10 but the aims and analyses were different from this larger analysis. Approval for the study was obtained by local institutional review board (study protocol n. 7461/2017). The study was managed and conducted in accordance with the Declaration of Helsinki and latest Good Clinical Practice guidelines. All ETTs were performed according to American College of Cardiology/American Heart Association practice guidelines using a Bruce protocol modified by two warm-up stages.11 12 ETT was only done if the patient was asymptomatic on symptom inquiry. The test was conducted by an exercise physiologist and either a cardiologist or cardiac nurse. During the test, subjects were questioned for symptoms every 2 min, and the haemodynamic parameters and a 12-lead ECG are recorded at baseline, at the end of each stage and at peak exercise. The test was stopped prematurely for symptoms (significant breathlessness or any chest constriction or dizziness), progressive ventricular ectopy >3 beats, new atrial fibrillation, a sustained fall in systolic blood pressure >20 mm Hg from the previous stage or more than 5 mm ST segment depression. Significant breathlessness was differentiated clinically from physiological breathlessness by the presence of distress, the inability to speak, facial pallor and sometimes associated ventricular ectopy or a fall in blood pressure. The following were recorded: reason(s) for stopping (symptom, fall in blood pressure, ventricular ectopy, ST segment depression and fatigue with physiological breathlessness), exercise time, exercise capacity in metabolic equivalents (METs), maximum rise in systolic blood pressure and maximum fall from peak and ST segment depression in millimetre. A positive ETT was defined by the development of a significant symptom or a fall in systolic blood pressure >20 mm Hg below baseline, or a sustained tachyarrhythmia. ST segment depression has repeatedly been shown to be non-specific in AS and was not used as a criterion of positivity. METs were calculated from the speed and gradient of the treadmill by the machine’s software using the formula (METS=[(speed × 0.1)+(gradient/100×1.8×speed)+3.5]/3.5), where speed is measured in metres per minute and grade as a percentage. One MET is usually defined as the energy expended at rest, which is equal to a body oxygen consumption of nearly 3.5 mL per kilogram of body weight for an average adult.13 A serious adverse event related to the exercise test was defined as death, sustained or non-sustained VT or syncope, or any other events that required overnight or prolonged hospitalisation. 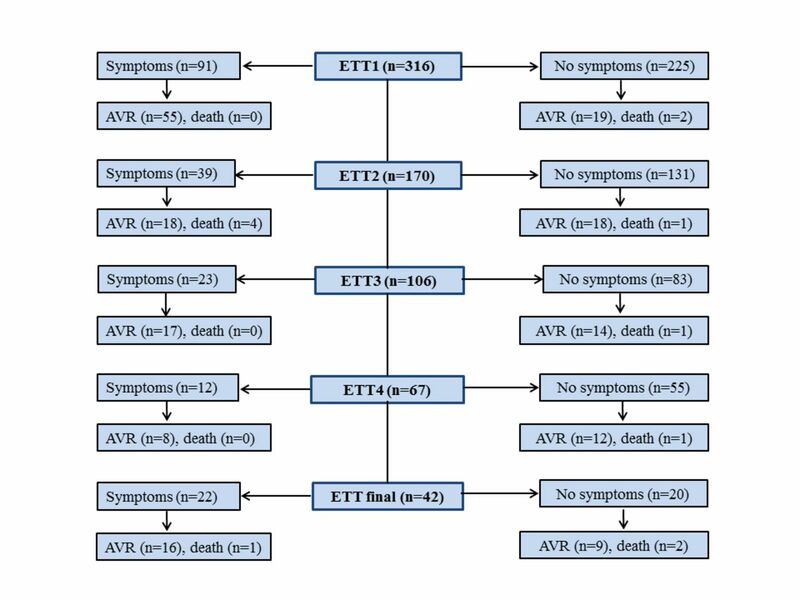 Tolerability was expressed as the proportion of patients with successful baseline ETT and being able to repeat the ETT during follow-up until the occurrence of symptoms justifying AVR or the occurrence of death. Patients underwent up to 14 exercise tests. Results for at maximum the first four exercise tests are reported. The final test is the last exercise test before an event or the end of follow-up. Echocardiographic data were obtained using commercially available ultrasound systems (Vingmed system versions 5, 7 and 9, GE Medical, Milwaukee, Wisconsin, USA and a Philips ‘Epiq 7’ cardiac ultrasound machine). The severity of AS, left ventricular (LV) wall thicknesses, chamber dimensions, stroke volume and ejection fraction were measured following the joint European Association of Cardiovascular Imaging and American Society of Cardiology guidelines.3 4 14 LV hypertrophy was diagnosed according to the prognostically validated cut-off values of LV mass >46.7 g/m2.7 in women and 49.2 g/m2.7 in men, respectively, and relative wall thickness as LV posterior wall thickness/LV internal radius at end-diastole, and considered increased if ≥0.430.15 EOA was calculated using the continuity equation employing the ratio of subaortic to transaortic systolic velocity integral. Endpoints recorded during follow-up were AVR (either surgical or via a transcatheter approach), all-cause mortality or a composite of AVR and all-cause mortality. Deaths were classified as cardiovascular or non-cardiac and confirmed by reviewing the electronic patient record or a death certificate with censoring date 19 September 2017. Follow-up time was calculated from the baseline ETT until AVR, death or censoring. SPSS V.24.0 was used for data management and statistical analyses. Continuous variables were tested for normality of distribution and presented as mean±SD, and categorical variables as percentages. Intergroup comparison was performed using Student’s t test or χ2 test, as appropriate. Random slope/intercept linear mixed effects models with first-order autoregression were used to estimate trends in continuous variables of ETT visits over time. Categorical variables were test with McNemar’s test. Survival curves were generated using Kaplan-Meier methods for the endpoints of interest, and groups were compared using two-sided log-rank tests. The incremental prognostic value of ETT in addition to standard parameters of AS severity was assessed by likelihood ratio χ2 test, Harrell’s C-statistics and comparing the area under the receiver operating characteristics curve with DeLong’s test; additionally, the continuous net reclassification improvement (NRI) and the integrated discrimination improvement (IDI) were demonstrated. Mixed model and predictive performance analyses were conducted with R V.3.4.3 (The R Foundation for Statistical Computing, Vienna, Austria). A p value <0.05 was considered to be statistically significant. The mean age of the cohort was 65±12 years, and 67% were men (table 1). At baseline, there were 210 (66%) with moderate AS and 106 (34%) with severe AS. Comorbidities were common, including systemic hypertension (74%), coronary artery disease (51%), hypercholesterolaemia (67%), obesity (26% with BMI >30 kg/m2) and diabetes (13%). Patients with moderate AS were younger but had a higher prevalence of coronary artery disease than those with severe AS (58% vs 38%, p=0.004) (table 1). In a total of 797 ETTs (mean 2.5 per patient, range 1–14), no serious adverse event was observed (table 2). In particular, no acute ST segment elevation myocardial infarction, acute cerebrovascular events or syncope were reported. One patient stumbled without injury when the treadmill speed was inadvertently increased at the end of exercise instead of stopping. During the baseline ETT, 91 (29%) patients had revealed symptoms leading to premature termination of ETT. The prevalence of revealed symptoms at baseline ETT was significantly higher in severe AS compared with moderate AS (table 2). The other reasons for stopping the ETT are summarised in the table 2. The event rates during 1 year follow-up after ETTs are shown in figure 1. The average time from the revealed symptoms to AVR was 10.7±10.3 months in moderate AS and 5.6±4.8 months in severe AS (p<0.01). Flow diagram showing 1 year event rates according to the presence or absence of symptoms at ETT. AVR, aortic valve replacement; ETT, exercise treadmill test. During a mean follow-up of 34.9±35.1 months, there were 264 endpoints including 30 all-cause deaths and class I indications for AVR in 234 patients (88 with severe AS and 145 with moderate AS, p<0.05) (table 1). Of the 30 deaths, 20 (67%) were cardiovascular related (table 1). The symptom-free survival with moderate AS was 72%±3% at 6 months, 65%±4% at 12 months, 58%±4% at 18 months and 52%±4% at 24 months (figure 2A). The symptom-free survival with severe AS was 61%±5% at 6 months, 46%±6% at 12 months, 33%±6% at 18 months and 26%±6% at 24 months (figure 2A). The event-free survival for patients without revealed symptoms was 94%±2% at 6 months, 87%±3% at 12 months, 81%±4% at 18 months and 70%±4% at 24 months (figure 2B). The event-free survival with revealed symptoms was 72%±3% at 6 months, 66%±4% at 12 months, 57%±4% at 18 months and 46%±4% at 24 months (figure 2B). Similarly, the event-free survival at 12 and 24 months with revealed symptoms was 79%±4% and 59%±5%, respectively, in moderate and 43%±6% and 19%±4% in severe AS (figure 2C,D). Kaplan-Meier plots showing the probability of symptom-free survival according to the severity of aortic stenosis (AS) (A) and event-free survival according to symptoms during ETT in entire study population (B), moderate AS (C) and severe AS (D). ETT, exercise treadmill test. At the time of the baseline, ETT patients with severe AS were older than patients with moderate AS (69.3±10.9 vs 63.7±13.5 years, p<0.001) (table 3). On the final ETT, this age difference was reversed, although the difference was not statistically significant (56.9±13.5 vs 66.7±12.7 years, p>0.05) (table 3). In patients with severe AS, a progressive decrease in revealed symptoms from 38% at baseline to 25% at the last study visit was observed, while the prevalence of revealed symptoms in patients with moderate AS was more heterogeneous without a conclusive trend but a significant increase at the last study visit (table 2). Overall, 59% of patients experienced symptoms during serial ETT conducted over a follow-up period of 34.9±35.1 months. 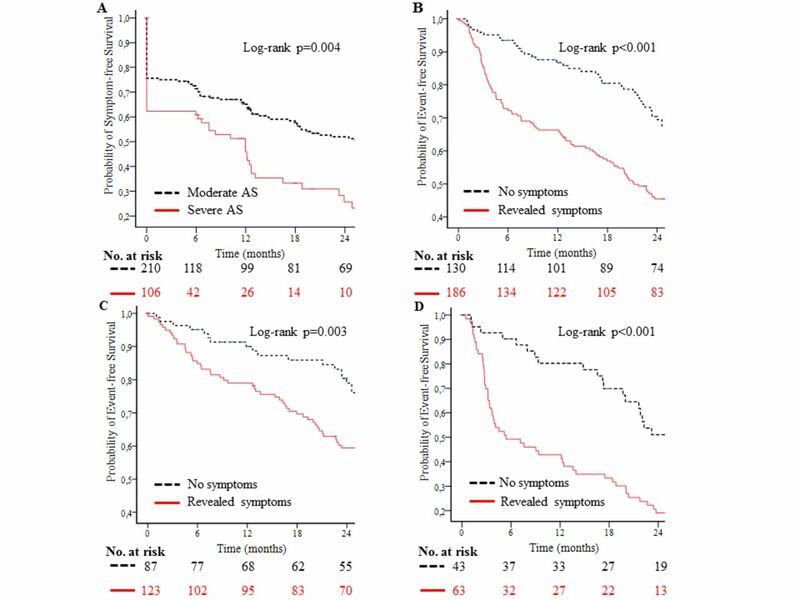 Net reclassification analysis was used to assess the incremental prognostic value of adding revealed symptoms to conventional markers of AS severity in a multivariable Cox model adjusted for age and gender. When revealed symptoms were added to EOA and peak aortic jet velocity, the area under the curve increased from 0.74 (95% CI 0.68 to 0.79) to 0.79 (95% CI 0.74 to 0.84) (DeLong’s test p=0.01) with an additional 26% improvement of risk classification (continuous NRI 0.261, 95% CI 0.036 to 0.356, p=0.02, and IDI 0.062, 95% CI 0.017 to 0.104, p=0.01) for the composite endpoint of AVR and all-cause mortality (figure 3) but not for all-cause mortality alone (continuous NRI 0.217, 95% CI −0.406 to 0.453, p=0.638, IDI 0.018 95% CI −0.010 to 0.148, p=0.279). When revealed symptoms were added to EOA and peak aortic jet velocity in separate models, our conclusion did not change. Receiver operating characteristic curve showing predictive performance of revealed symptoms by exercise testing. AUC, area under the curve; IDI, integrated discrimination improvement; NRI, net reclassification improvement. Our results demonstrate that ETT in patients with asymptomatic moderate or severe AS is safe with no medical complications being observed in a total of 797 tests. ETT reveals symptoms in patients apparently asymptomatic on the history. On the initial ETT symptoms were revealed in 38% with severe AS and 23% with moderate AS. At some point during serial testing, symptoms were revealed in 55% with initially moderate AS and 40% with severe AS. Event-free survival at 1 year was 87%±3% in patients who were asymptomatic on ETT compared with 66%±4% in those with revealed symptoms. We showed revealed symptoms in 29% of patients on the baseline ETT. This is broadly similar to the findings presented by Lancellotti et al showing that at least 36% of patients exhibited an abnormal exercise test. However, Lancellotti et al included only 69 patients in their study, and serial echocardiographic assessment with exercise test over time was not performed19. No previous study has reported the results of serial ETT. Our practice is to perform an ETT at baseline, then when the AS crosses from moderate to severe and thereafter usually once each year if a patient is at low risk of cardiac surgery. We showed that serial studies, as expected, produced an incremental increase in the number of patients with revealed symptoms and risk improvement. This is important since studies investigating the prognostic effect of a single baseline test may underestimate the clinical value of ETT.20 In EXTAS, the frequencies of ETTs reflected the severity of AS: the lower the numbers of ETTs, the more severe AS. In patients with severe AS, a progressive decrease in revealed symptoms was observed. This may reflect the decreasing number of patients with severe AS due to AVR and death during follow-up. However, those who reached three or more ETTs were younger, had fewer comorbidities and showed a significantly better performance during ETT. There are a number of reasons why patients may appear asymptomatic on the history but have symptoms revealed by ETT. Some may lead too sedentary a life to experience symptoms spontaneously. It is possible that others do not have symptoms because they reduce their level and pace of activity to avoid symptoms. They may also attribute mild dyspnoea or reduced exercise capacity to age and not AS. Some with cognitive impairment may forget that they experience spontaneous symptoms. By contrast, there is concern that revealed symptoms are subjective and not a valid reason for offering AVR. However, symptoms are associated with a fall in stroke volume, while patients who remain symptom free have a progressive rise in stroke volume.9 We have recently shown that the physiological response to exercise is the same for revealed as for spontaneous symptoms.22 Furthermore, a significant proportion of patients with revealed symptoms develop cardiac events or spontaneous symptoms within 1 year.1 18 Since the onset of symptoms is associated with a sharp increase in the risk of death, ETT is essential to guide timely referral for surgery. Exercise testing is safe and well tolerated in moderate or severe AS and reveals symptoms not volunteered on the history. 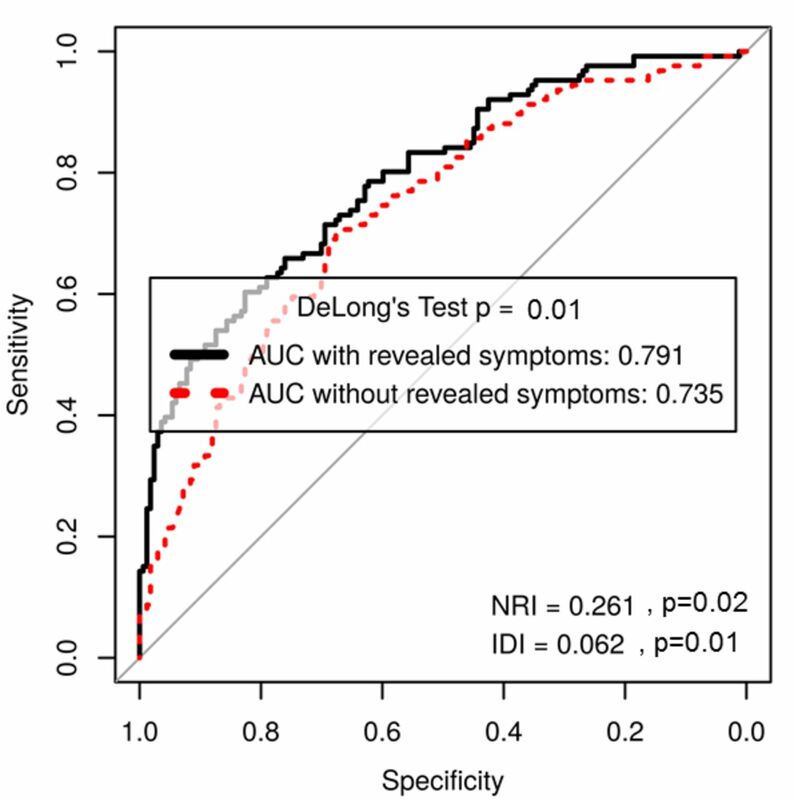 Serial testing adds incremental prognostic information to one performed at baseline. Our findings support the use of exercise testing for risk stratification to guide the timing of AVR in patients with apparently asymptomatic AS. Current guidelines recommend exercise testing to reveal occult symptoms in patients with aortic stenosis (AS) who appear asymptomatic on initial assessment. However, it is known that only approximately 6% of patients, in whom it is indicated, are assessed using treadmill or bicycle exercise. This may be for many reasons including a residual concern about safety and tolerability. Exercise testing is safe and well tolerated in moderate or severe aortic AS and reveals symptoms in patients who are apparently asymptomatic on the history. Serial testing adds incremental prognostic information to one performed at baseline. Normal exercise treadmill test predicts better prognosis and signifies lower incidence of future cardiac events. Our findings support the utilisation of exercise testing in patients with AS in routine clinical care. Patients can then be offered a timely intervention to avoid the risk of sudden death, which is highest at the onset of symptoms. The current work has been carried out at Guy’s & St Thomas' Hospital, Cardiothoracic Centre, London, UK.
. AHA/ACC Guideline for the Management of Patients With Valvular Heart Disease: executive summary: a report of the American College of Cardiology/American Heart Association Task Force on Practice Guidelines. Circulation 2014;2014:2440–92.
. Hypertension in aortic stenosis implications for left ventricular structure and cardiovascular events. Hypertension 2012;60:90–7.
. American College of Cardiology/American Heart Association Task Force on Practice Guidelines. ACC/AHA 2002 guideline update for exercise testing: summary article: a report of the American College of Cardiology/American Heart Association Task Force on Practice Guidelines. Circulation 2002;106:1883–92.
. Relation of left ventricular mass to prognosis in initially asymptomatic mild to moderate aortic valve stenosis. Circ Cardiovasc Imaging 2015;8:e003644.
. Prognostic Importance of quantitative exercise doppler echocardiography in asymptomatic valvular aortic stenosis. Circulation 2005;112:377–82.
. The physiological correlates of exercise induced symptoms in apparently asymptomatic patients with aortic stenosis. JASE. Contributors SS: collecting data, planning study design, writing paper, statistics and interpretation of data and submitting the manuscript. RR: collecting data and writing paper. RS: statistics and interpretation of data, critical review of the study and writing paper. DP: collecting data. JBC: conception and design of the study, supervising, collecting data, interpretation of data and writing and critical review of the paper. All authors have read and approved it for submission to Heart. Funding This work was supported by Department of Heart Disease, Haukeland University Hospital, Bergen, Norway. Ethics approval Institutional review board at Guy’s and St. Thomas’ Hospital, London.